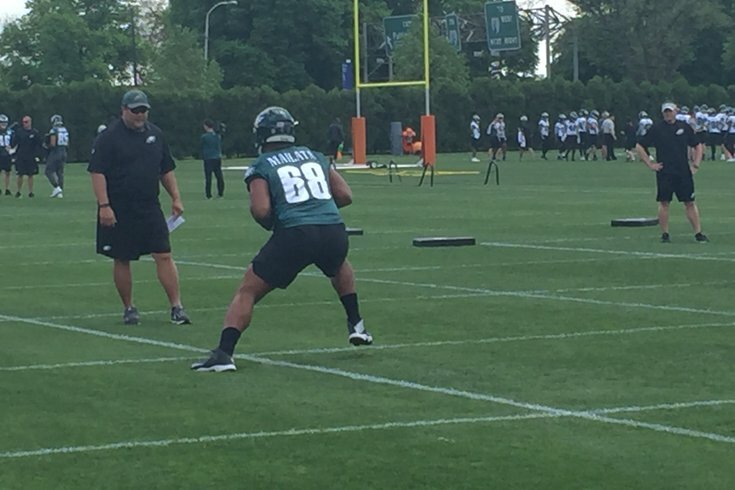 Former Australian rugby player and Philadelphia Eagles seventh-round draft pick Jordan Mailata practices with a coach at the Nova Care Complex in South Philly on Friday, May 11, 2018. And then I wondered if I could maybe compare him to an offensive lineman who also lines up at fullback on occasion. Obviously, as you can see above, Mailata can run with the ball, and I'm sure he could figure out how to flatten defenders from the fullback position if he is able to make a team as a tackle. The player I came up with in regard was former Vikings OG Randall McDaniel, who did that regularly back in the day. But obviously, to compare a 6-foot-8, 346-pound tackle with no experience playing football at all to a 6-foot-4, 287-pound Hall-of-Fame guard would be asinine. So instead, I just tried to find an NFL offensive lineman who most closely matched Mailata's measurables. The closest match I could find? Former Eagle Stacy Andrews! Remember him? He was the brother of Shawn Andrews, and the guy the Eagles signed the day Brian Dawkins left for Denver. The Eagles tried to hold a press conference for Andrews, while expecting the media not to ask about Dawkins, lol. Arm length 35 1/2" 34 3/4"